Germfree provides a fully adaptable Cleanroom solution that supports manufacturing for pre-clinical or clinical stage materials in a single or multiple-module Cleanroom building. Once scale up or scale out needs are identified, additional modules can be added seamlessly. As well, a mobile solution can be used and then upgraded into a modular platform to provide the fastest implementation of Pre-clinical and early Phase discovery. The Germfree bioGO Cleanroom Solution adapts with your business needs by optimizing your company’s time to market and return on investment. Established in 1977 and Headquartered in Dublin, Ireland, Ardmac is an international construction company that delivers high value workspaces and technical environments. 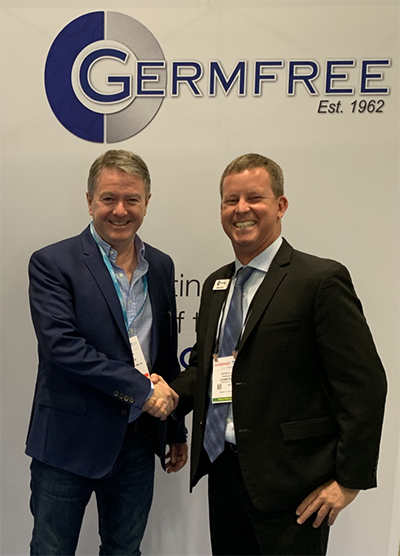 Germfree, established in 1962 and Headquartered in Ormond Beach, Florida is a global company working to create environments that serve life science innovation and advance global health.